EZRentOut recently went live with its equipment rental management app on Google Chrome web store. 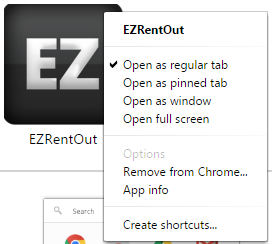 This will enable you to add EZRentout to your Chrome Apps tab making it even more easily accessible. Manage your rentals with rental software more efficiently by adding EZRentOut app to your chrome browser today. – No need to remember web URLs: EZRentOut icon shows up in the app launcher (Open a new tab -> click ) so you can easily find and open the app. – Access EZRentOut app on any computer: Google Chrome’s sync feature saves your app to your Google Account, so its always available no matter which computer you’re using. – On the Google Chrome web store search for ‘EZRentOut’ or click here. – The image below illustrates the process of adding EZRentOut app to your chrome browser. This entry was posted in [Support], productivity and tagged chrome app, ezrentout app by admin. Bookmark the permalink.